Attention deficit/hyperactivity disorder (ADHD) may affect all aspects of a child’s life. Indeed, it impacts not only on the child, but also on parents and siblings, causing disturbances to family and marital functioning. The adverse effects of ADHD upon children and their families changes from the preschool years to primary school and adolescence, with varying aspects of the disorder being more prominent at different stages. ADHD may persist into adulthood causing disruptions to both professional and personal life. In addition, ADHD has been associated with increased healthcare costs for patients and their family members. Attention deficit/hyperactivity disorder (ADHD) is a chronic, debilitating disorder which may impact upon many aspects of an individual’s life, including academic difficulties,1 social skills problems,2 and strained parent-child relationships.3 Whereas it was previously thought that children eventually outgrow ADHD, recent studies suggest that 30–60% of affected individuals continue to show significant symptoms of the disorder into adulthood.4 Children with the disorder are at greater risk for longer term negative outcomes, such as lower educational and employment attainment.5 A vital consideration in the effective treatment of ADHD is how the disorder affects the daily lives of children, young people, and their families. Indeed, it is not sufficient to merely consider ADHD symptoms during school hours—a thorough examination of the disorder should take into account the functioning and wellbeing of the entire family. As children with ADHD get older, the way the disorder impacts upon them and their families changes (fig 1). The core difficulties in executive function seen in ADHD7 result in a different picture in later life, depending upon the demands made on the individual by their environment. This varies with family and school resources, as well as with age, cognitive ability, and insight of the child or young person. An environment that is sensitive to the needs of an individual with ADHD and aware of the implications of the disorder is vital. Optimal medical and behavioural management is aimed at supporting the individual with ADHD and allowing them to achieve their full potential while minimising adverse effects on themselves and society as a whole. The aim of this paper is to follow the natural history of this complex disorder through preschool years, school life, and adulthood and to consider its effect on the family, the community, and society as a whole. In addition, comorbidities and healthcare costs are examined. The primary school child with ADHD frequently begins to be seen as being different as classmates start to develop the skills and maturity that enable them to learn successfully in school. Although a sensitive teacher may be able to adapt the classroom to allow an able child with ADHD to succeed, more frequently the child experiences academic failure, rejection by peers, and low self esteem (fig 2). Comorbid problems, such as specific learning difficulties, may also start to impact on the child, further complicating diagnosis and management. Assessment by an educational psychologist may help to unravel learning strengths and difficulties, and advise on necessary support in the classroom. Frequently, difficulties at home or on outings with carers (for example, when shopping, out in the park, or visiting other family members) also become more apparent at this age. Parents may find that family members refuse to care for the child, and that other children do not invite them to parties or out to play. Many children with ADHD have very poor sleep patterns, and although they appear not to need much sleep, daytime behaviour is often worse when sleep is badly affected. As a result, parents have little time to themselves; whenever the child is awake they have to be watching them. Not surprisingly, family relationships may be severely strained, and in some cases break down, bringing additional social and financial difficulties.14 This may cause children to feel sad or even show oppositional or aggressive behaviour. Johnston and Mash reviewed the evidence of the effect of having a child with ADHD on family functioning.14 They concluded that the presence of a child with ADHD results in increased likelihood of disturbances to family and marital functioning, disrupted parent-child relationships, reduced parenting efficacy, and increased levels of parent stress, particularly when ADHD is comorbid with conduct problems. Broader social and family functioning has been assessed using the Child Health Questionnaire (CHQ), a parent rated health outcome scale that measures physical and psychosocial wellbeing.22–24 The studies demonstrated that treatment of ADHD with atomoxetine, a new non-stimulant medication for ADHD, resulted in improved perception of quality of life, with improvements being apparent in social and family functioning, and self esteem. Further research assessing the ongoing quality of life for the child and their family following multimodal input is urgently needed. Antisocial behaviour in adolescents with ADHD.26 Data primarily represents outcomes in those with conduct disorder as teenagers. Impact of ADHD in adolescence. Data from Barkley RA;26 (A) Impact at school; (B) impact on health, social, and psychiatric wellbeing. As many as 60% of individuals with ADHD symptoms in childhood continue to have difficulties in adult life.32,33 Adults with ADHD are more likely to be dismissed from employment and have often tried a number of jobs before being able to find one at which they can succeed.5 They may need to choose specific types of work and are frequently self employed. In the workplace, adults with ADHD experience more interpersonal difficulties with employers and colleagues. Further problems are caused by lateness, absenteeism, excessive errors, and an inability to accomplish expected workloads. At home, relationship difficulties and break-ups are more common. The risk of drug and substance abuse is significantly increased in adults with persisting ADHD symptoms who have not been receiving medication.34 The genetic aspects of ADHD mean that adults with ADHD are more likely to have children with ADHD. This in turn causes further problems, especially as the success of parenting programmes for parents of children with ADHD is highly influenced by the presence of parental ADHD.35 Thus, ADHD in parents and children can lead to a cycle of difficulties. ADHD and comorbidity in Swedish school age children.37 MR, mental retardation; RWD, reading/writing disorder; DC, developmental coordination; ODD, oppositional defiant disorder. Growth deficits in children receiving stimulant treatment for ADHD have long been the subject of scientific discussion. Conflicting results have been reported with some authors indicating that stimulants do indeed affect growth in children,41–43 but that this only occurs during active treatment phase and does not compromise final height.44 Other studies, however, have not found any evidence to suggest that stimulants influence growth.45,46 Taken together, the results suggest that clinicians should monitor the growth of hyperactive children receiving stimulants, and consider dose reduction in individual cases should evidence of growth suppression occur. Another frequently quoted concern about treatment of ADHD with stimulant medications is that it could lead to drug addiction in later life. Young people with ADHD are by nature impulsive risk takers, and there is clear evidence that untreated ADHD—especially with concomitant conduct disorder—is associated with a three- to fourfold increase in the risk of substance misuse.47,48 In contrast, patients medicated with stimulants have a similar risk of substance misuse to controls.49 These data therefore provide strong evidence in favour of careful treatment and support for young people with ADHD. Mannuzza’s review of the long term prognosis in ADHD concludes that childhood ADHD does not preclude high educational and vocational achievements (for example, Master’s degree or medical qualification).61 However, ADHD is a disorder that may affect all aspects of a child’s life. Careful assessment is paramount, and if this demonstrates significant impairment as a result of ADHD, there is clear evidence that treatment of ADHD should be instituted.62,63 Current treatment focuses mainly on the short term relief of core symptoms, mainly during the school day. This means that important times of the day, such as early mornings before school and evening to bedtime, are frequently unaffected by current treatment regimes. This can negatively impact on child and family functioning and fail to optimise self esteem and long term mental health development. In 2003, the American Academy of Pediatrics recommended that clinicians should work with children and their families to monitor the success (or failure) of treatment, using certain criteria to assess specific areas of difficulty and quality of life as a whole.64 There has been a reluctance in the UK to treat ADHD with medication, fuelled by concerns about possible over-prescription in the USA. In addition, newspaper and media coverage of ADHD is often negative and stigmatising. The evidence of potentially severe difficulties for the child, the family, and, in some cases, for society as a whole, means that coordinated multi-agency effort to support the child and family is essential. Moreover, healthcare professionals have an important role in providing balanced and supportive information about ADHD and meeting the needs of affected individuals and their families. Faraone SV, Biederman J, Monuteaux MC, et al. A psychometric measure of learning disability predicts educational failure four years later in boys with ADHD. J Atten Disord2001;4:220–30. Bagwell CL, Molina BS, Pelham WE, et al. ADHD and problems in peer relations: Predictions from childhood to adolescence. J Am Acad Child Adolesc Psychiatry2001;40:1285–92. Johnston C, Mash EJ. Families of children with ADHD: review and recommendations for future research. Clin Child Fam Psychol Rev2001;4:183–207. Weiss G, Hechtman L. Hyperactive children grown up: ADHD in children, adolescents and adults. New York: Guildford, 1993. Mannuzza S, Klein RG, Bessler A, et al. Adult outcome of hyperactive boys. Educational achievement, occupational rank and psychiatric status. Arch Gen Psychiatry1993;50:565–76. Kewley GD. Attention deficit hyperactivity disorder: Recognition, reality and resolution. London: David Fulton Publishers, 1999. Barkley RA. Behavioral inhibition, sustained attention, and executive functions: constructing a unifying theory of ADHD. Psychol Bull1997;121:65–94. Alessandri SM. Attention, play, and social behaviour in ADHD preschoolers. J Abnorm Child Psychol1992;20:289–302. DuPaul GJ, McGoey KE, Eckert TL, et al. Preschool children with attention-deficit/hyperactivity disorder: impairments in behavioural, social, and school functioning. J Am Acad Child Adolesc Psychiatry2001;40:508–15. Sonuga-Barke EJ, Daley D, Thompson M, et al. Parent-based therapies for preschool attention-deficit/hyperactivity disorder: a randomised, controlled trial with a community sample. J Am Acad Child Adolesc Psychiatry2001;40:402–8. Barton J. PhD Thesis. The effect of modifying maternal expressed emotion on outcome of preschool hyperactivity. University of Glasgow 2002. Barkley R. Psychosocial treatments for attention-deficit/hyperactivity disorder in children. J Clin Psychiatry2002;63:36–43. Landgraf JM, Abetz L, Ware JE. The CHQ User’s Manual, 2nd edition. Boston: HealthAct, 1999. Johnston C, Mash EJ. Families of children with attention-deficit/hyperactivity disorder: review and recommendations for future research. Clin Child and Fam Psychol Rev2001;4:183–207. Kaidar I, Wiener J, Tannock R. The attributions of children with attention-deficit/hyperactivity disorder for their problem behaviors. J Atten Disord2003;6:99–109. Frame K, Kelly L, Bayley E. Increasing perceptions of self-worth in preadolescents diagnosed with ADHD. J Nurs Scholarsh2003;35:225–9. Podolski CL, Nigg JT. Parent stress and coping in relation to child ADHD severity and associated child disruptive behaviour problems. J Clin Child Psychol2001;30:503–13. Faraone SV, Biederman J, Chen WJ, et al. Genetic heterogeneity in attention-deficit hyperactivity disorder (ADHD): gender, psychiatric comorbidity, and maternal ADHD. J Abnorm Psychol1995;104:334–45. Pelham WE Jr, Lang AR. Can your children drive you to drink? Stress and parenting in adults interacting with children with ADHD. Alcohol Res Health1999;23:292–8. Szatmari P, Offord DR, Boyle MH. Ontario Child Health Study: prevalence of attention deficit disorder with hyperactivity. J Child Psychol Psychiatry1989;30:219–30. Kendall J, Siblings accounts of attention deficit hyperactivity disorder. Family Proc1999;38:117–36. Michelson D, Faries D, Wernicke J, et al. Atomoxetine in the treatment of children and adolescents with attention-deficity/hyperactivity disorder: a randomised, placebo-controlled, dose response study. Pediatrics2001;108:1–9. Barton J, Prasad S, Buitelaar JK, et al. 10-week, open-label, acute treatment with atomoxetine in non-North American children with ADHD. Poster presented at the Royal College of Psychiatrists Annual General Meeting. Edinburgh, UK, 30 June–3 July 2003. Harpin V. Changes in quality of life in patients with attention-deficit-hyperactivity disorder after atomoxetine treatment. Paper presented at the meeting of the European Academy of Childhood Disability (EACD). Norway: Oslo, 2–4 October, 2003. Krueger M, Kendall J. Descriptions of self: an exploratory study of adolescents with ADHD. J Child Adolesc Psychiatr Nurs2001;14:61–72. Barkley RA. Attention deficit hyperactivity disorder: A handbook for diagnosis and treatment, 2nd edition. New York: Guildford Press, 1998. Edwards G, Barkley RA, Laneri M, et al. Parent–adolescent conflict in teenagers with ADHD and ODD. J Abnormal Child Psychology2001;29:557–72. Meltzer H, Gatward R, Goodman R, et al.The mental health of children and adolescents in Great Britain. Office for National Statistics, London: The Stationery Office, 2000. Barkley RA, Guevremont DC, Anastopoulos AD, et al. 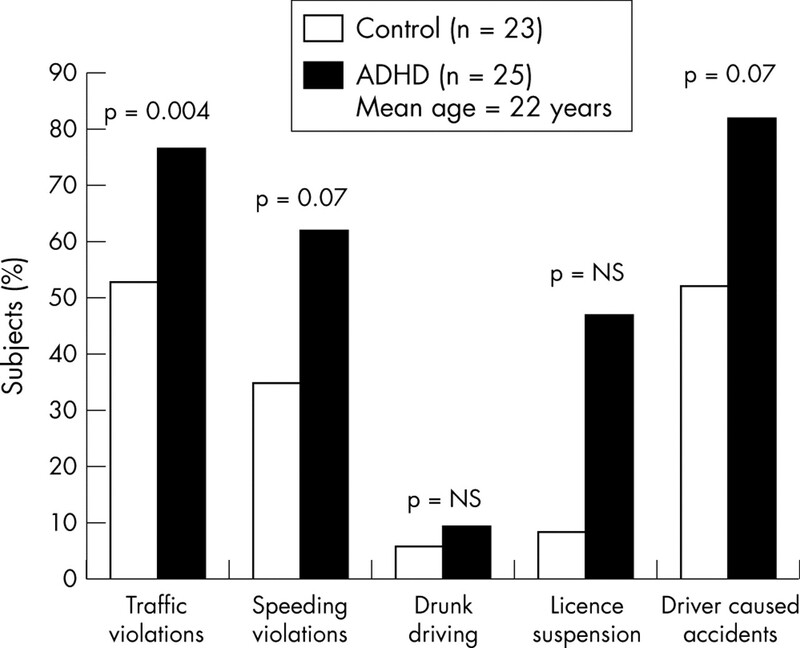 Driving-related risks and outcomes of attention deficit hyperactivity disorder in adolescents and young adults: A 3 to 5 year follow up survey. Pediatrics1993;92:212–18. Barkley RA, Murphy KR, Kwasnik D. Motor vehicle driving competencies and risks in teens and young adults with attention deficit hyperactivity disorder. Pediatrics1996;98:1089–95. Cox DJ, Merkel RL, Penberthy JK, et al. Impact of methylphenidate delivery profiles on driving performance of adolescents with attention-deficit/hyperactivity disorder: a pilot study. J Am Acad Child Adolesc Psychiatry2004;43:269–75. Weiss G, Hechtman L, Milroy T, et al. Psychiatric status of hyperactives as adults: a controlled prospective 15-year follow-up of 63 hyperactive children. J Am Acad Child Psychiatry1985;24:211–20. Weiss M, Hechtman L, Weiss G. ADHD in Adulthood—A guide to current theory, diagnosis and treatment. Baltimore: Johns Hopkins University Press, 1999. Biederman J, Wilens TE, Mick E, et al. Does attention-deficit hyperactivity disorder impact the development course of drug and alcohol abuse and dependence? Biol Psychiatry1998;44:269–73. Sonuga-Barke EJ, Daley D, Thompson M. Does maternal ADHD reduce the effectiveness of parent training for preschool children’s ADHD? J Am Acad Child Adolesc Psychiatry2002;41:696–702. Biederman J, Newcom J, Sprich S. Comorbidity of attention deficit hyperactivity disorder with conduct, depressive, anxiety and other disorders. Am J Psychiatry1991;148:564–77. Kadesjo B, Gillberg C. The comorbidity of ADHD in the general population of Swedish school-age children. J Child Psychol Psychiatry2001;42:487–92. Freeman RD, Fast DK, Burd L, et al. An international perspective on Tourette syndrome: selected findings from 3,500 individuals in 22 countries. Dev Med Child Neurol2000;42:436–47. Gillberg C, Gillberg IC, Rasmussen P, et al. 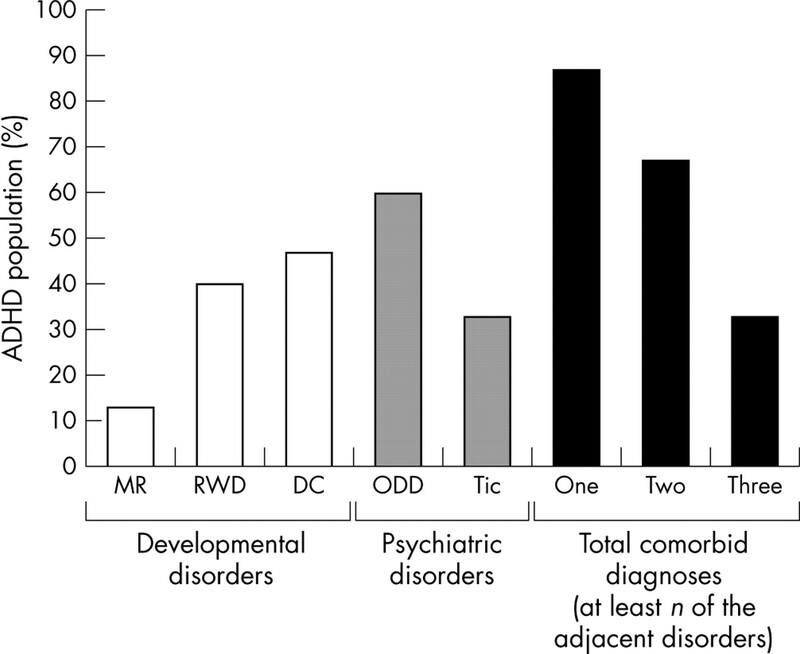 Co-existing disorders in ADHD—implications for diagnosis and intervention. Eur Child Adolesc Psychiatry2004;13 (Suppl 1) :I80–92. Taylor E. Clinical foundations of hyperactivity research. Behav Brain Res1998;94:11–24. Mattes JA, Gittelman R. Growth of hyperactive children on maintenance regimen of methylphenidate. Arch Gen Psychiatry1983;40:317–21. Lisska MC, Rivkees SA. Daily methylphenidate use slows the growth of children: a community based study. J Pediatr Endocrinol Metab2003;16:711–18. Poulton A, Cowell CT. Slowing of growth in height and weight on stimulants: a characteristic pattern. J Paediatr Child Health2003;39:180–5. Klein RG, Mannuzza S. Hyperactive boys almost grown up. III. Methylphenidate effects on ultimate height. Arch Gen Psychiatry1988;45:1131–4. Spencer T, Biederman J, Wilens T. Growth deficits in children with attention deficit hyperactivity disorder. Pediatrics1998;102:501–6. Biederman J, Faraone SV, Monuteaux MC, et al. Growth deficits and attention-deficit/hyperactivity disorder revisited: impact of gender, development, and treatment. Pediatrics2003;111:1010–16. Biederman J, Wilens TE, Mick E, et al. Does attention-deficit hyperactivity disorder impact the developmental course of drug and alcohol abuse and dependence? Biol Psychiatry1998;44:269–73. Wilens TE. Impact of ADHD and its treatment on substance abuse in adults. J Clin Psychiatry2004;65 (Suppl 3) :38–45. Biederman J, Wilens T, Mick E, et al. Pharmacotherapy of attention-deficit/hyperactivity disorder reduces risk for substance use disorder. Pediatrics1999;104:e20. Leibson CL, Katusic SK, Barbaresi WJ, et al. Use and costs of medical care for children and adolescents with and without attention-deficit/hyperactivity disorder. JAMA2001;285:60–6. DiScala C, Lescohier I, Barthel M, et al. Injuries to children with attention deficit hyperactivity disorder. Pediatrics1998;102:1415–21. Sullivan MA, Rudnik-Levin F. Attention deficit/hyperactivity disorder and substance abuse. Diagnostic and therapeutic considerations. Ann N Y Acad Sci2001;931:251–70. Schubiner H, Tzelepis A, Milberger S, et al. Prevalence of attention-deficit/hyperactivity disorder and conduct disorder among substance abusers. J Clin Psychiatry2000;61:244–51. Swensen AR, Birnbaum HG, Secnik K, et al. Attention-deficit/hyperactivity disorder: increased costs for patients and their families. J Am Acad Child Adolesc Psychiatry2003;42:1415–23. Cunningham CE, Benness BB, Siegel LS. Family functioning, time allocation, and parental depression in the families of normal and ADHD children. J Clin Child Psychol1988;17:169–77. Brown RT, Pacini JN. Perceived family functioning, marital status, and depression in parents of boys with attention deficit disorder. J Learn Disabil1989;22:581–7. Hankin CS. ADHD and its impact on the family. Drug Benefit Trends2001;13 (Suppl C) :15–16. Huss M, Lehmkuhl U. Methylphenidate and substance abuse: a review of pharmacology, animal and clinical studies. J Atten Disord2002;6 (Suppl 1) :S65–71. Faraone SV, Wilens T. Does stimulant treatment lead to substance use disorders? J Clin Psychiatry2003;64 (Suppl 1) :9–13. Mannuzza S, Klein RG, Moulton JL 3rd. oes stimulant treatment place children at risk for adult substance abuse? A controlled, prospective follow-up study. J Child Adolesc Psychopharmacol2003;13:273–82. Mannuzza S, Klein RG. Long-term prognosis in attention-deficit/hyperactivity disorder. Child Adolesc Psychiatr Clin N Am2000;9:711–26. National Institute for Clinical Excellence (NICE). Guidance on the use of methylphenidate (Ritalin, Equasym) for attention deficit/hyperactivity disorder (ADHD) in childhood. Health Technology Assessment No 13. October 2000. The MTA Cooperative Group. A 14-month randomised clinical trial of treatment strategies for attention-deficit/hyperactivity disorder. Arch Gen Psychiatry1999;56:1073–86. American Academy of Pediatrics, Reiff MI, Tippins S. ADHD—A Complete and Authoritative Guide. Chicago: Independent Publishers Group, 2003.